Who on earth doesn't want to sparkle at Christmas time? Well now you can, with these little gems I've come across, you can have a bit of sparkle this Christmas on any budget! Some of these are sale items so if you're interested you'll have to snap them up quick! 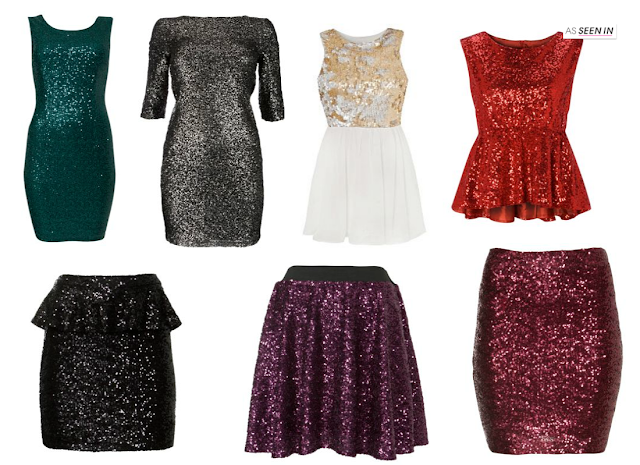 My favourites are the green dress and purple skater skirt from New Look, love! What are your thoughts on sequinned items this time of year? Yes or no? Love the green and grey dresses, I love Christmas time as an excuse to wear some sparkle! oooh love all of these sparkles! so festive! LOVE these :) I need one for New Year's Eve!